The new Galaxy SIII model will have a 4.8 inch AMOLED screen, 8 megapixel camera and will use the latest version of Google’s Android software, Ice Cream Sandwich version 4.0. 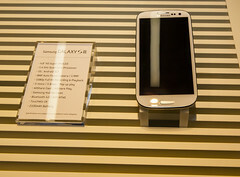 The South Korean technology group said the new Galaxy SIII model would go on sale in some markets in late May and around the world from June. The screen is 1,280 by 720 pixels, it has HSPA+ connectivity, the removable battery is 2,100mAh, and it’s packed with a quad-core Exynos processor. The phone will come in blue or white colours and in three memory sizes (16GB, 32GB and 64GB), with the ability to add memory via a microSD card. It also features ‘S’ Voice.